Please note that the leading lights shown on charts 3746 / 2131 into Loch Goil were removed on 09/11/2016. The replacement is a Directional Sectored Light on the front of the Perch that was established on 20/01/2017 and is shown on the new chart below. 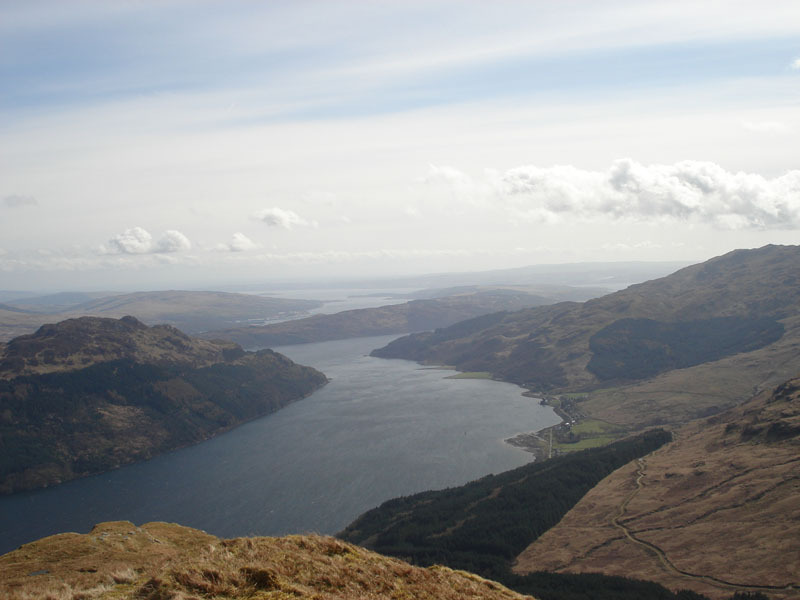 The Ministry of Defence (MOD) Experimental Facility within Loch Goil is used to conduct trials on warships of all shapes and sizes. When “Active”, there is an associated traffic control measure set out within the notes to the appropriate Charts (see 3746 / 2131) and within the West of Scotland Pilot (NP 66 Chapter 3 Art 3.356). The frequent closure of Loch Goil, while trials are in progress, is signalled by the display of large red flags at Douglas Pier and Carrick Castle Pier. Telephone: 01301 702011 or VHF Channel 69 – Call Sign “GOLF XRAY ALPHA” or contact the Police launch on channel 73. Informing the staff of their intentions and ask for clearance. Mariners may be asked to delay for a short period of time, to allow the collection of certain measurements to complete. Vessels under sail should not be inconvenienced, but they should give the Experimental Area as wide a berth as practical. For full details of the upper Clyde area down to Cloch Point click on Speed Limits. The Ministry of Defence Police – Clyde Marine Unit – offer a Boatwatch scheme. Leaflets to register are obtainable from this police unit at HMNB Clyde, Dunbartonshire, G84 8HL – telephone 01436 677291 or from the Secretary of the Carrick Castle Boat Club. Please note the current Clyde Regulations and Byelaws are being updated and when published they will be summaried here. A new Order cited as the Clyde Dockyard Port of Gareloch and Loch Long Order 2011 #1680 came into force on 21st July 2011 and can be accessed in full on the Speed Limits page. There are two blue 15 tonne Visitors Moorings to the north of the castle – see Visitors Moorings. There are 50 Private Mooring positions in Carrick Castle – Do not use any of these moorings as many are just 1 or 2 tonne light moorings. They all say use a Visitors Mooring or Anchor. Castle Bay, Carrick Castle – anchor off the castle. 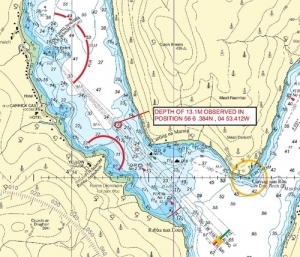 Swine’s Hole, Carrick Castle – Please note that this anchorage is on the west shore on entering Loch Goil between the two red navigation buoys No 1 & No 2. You can anchor well into this sheltered bay (except easterlies). 1) The castle is not open to the public but it is worth getting close to it to appreciate its size and history. The castle is situated on a rock (Gaelic Carraig – rock). The earliest parts which were built by the Campbells of Loch Awe, date from the late 14th century, though it is probable that an earlier stronghold, held by the Lamonts was on the same site. The name is first recorded in 1428, when a legal summons was served on Duncan Campbell at “le Carryk”. The castle appears to have been an important staging post between the Clyde and Loch Fyne; Mary Queen of Scots spent a night there in 1563 en route to Inveraray. From the late 15th century to 1685 the castle was held by the Earls of Argyll by hereditary captains who were required to maintain the castle and its attached lands at there own expense. In 1685 the captain, John Campbell, was summoned to Edinburgh to prevent his aiding the ninth Earl of Argyll, who was involved in a plot to dispose of James V11; in May of that year the castle was destroyed by order of the Privy Council. No attempt was made to restore it and the Argyll family retained the superiority. In the first decade of the 20th century some work was carried out, e.g. repointing, etc. The castle is now privately owned. Carrick Castle: a symbol and source of Campbell power in south Argyll from the 14th to the 17th century – archaeological investigations were conducted at Carrick Castle, over a 10-year period. Click here for the full report. 2) Walks – Apart from the shore line walk through the village along the road there are six walks behind the village ranging in length and time. Starting all walks from the castle the shortest is 45 minutes and the longest about six hours that is to Cruach nam Misaig, the mountain to the north of the village at 606 metres. Although this mountain is just 1 ½ miles from the village in a direct line it is about 9 miles round trip from and back to the castle. All walks are shown on separate pages with photographs in the Walks section. It is also possible to walk to Ardentinny in about 4 hours (12.9 km / 8 miles one way, village to village). The first part of the walk after Ardnahein (15 minutes from the castle) to the south of the village has now been restored. You can also walk the first part of this walk (Walk 7) to the forestry road that the path joins to Ardentinny. The round trip to that forestry road from the castle takes 1 3/4 hours. 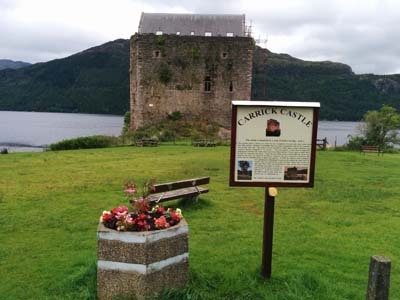 There is also another walk just outside Carrick Castle on the road to Lochgoilhead about 2 1/4 miles away. This Forestry Commission walk has it’s own website at Cormonachan Woodlands. Buses from Carrick Castle pass the woodlands 5 times a day each way, except on Sundays. The bus times are displayed in the bus shelter by the car park behind the castle. 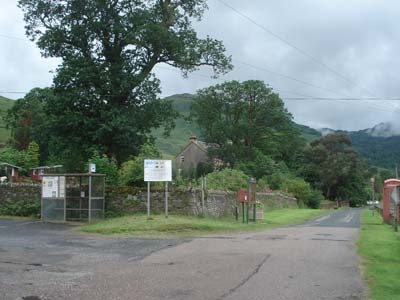 and Village Notice Board and Post Box to the right.